Explanation: Did you see it? The last conjunction of Moon and bright planets in 2008 featured a young crescent Moon and brilliant Venus in the west after sunset on December 31st. Seen here in dark, clear, mountain air from M&ouml;nichkirchen, Austria, are the two celestial beacons that dominate planet Earth's night sky. That pair was hard to miss, but skygazers watching lower along the western horizon in early twilight might also have glimpsed a pairing of Jupiter and Mercury as they both wandered closer to the Sun in the sky at year's end. Still, while this single, 5 second long exposure seriously overexposes the Moon's sunlit crescent, it does capture another planet not visible to the unaided eye. 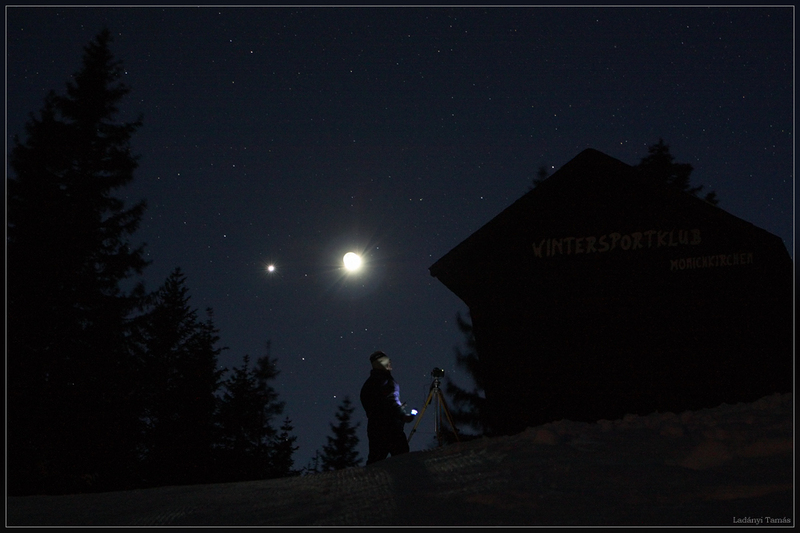 The tiny pinprick of light just above the photographer's head in the picture is the distant planet Neptune.